Natural stone is a dynamic material, which exhibits tremendous variance of its core natural characteristics; the palette of colors and diversity of textures is extensive. Distinctive luster of the natural stone communicate elegance and quality that cannot be imitated by any other substance. 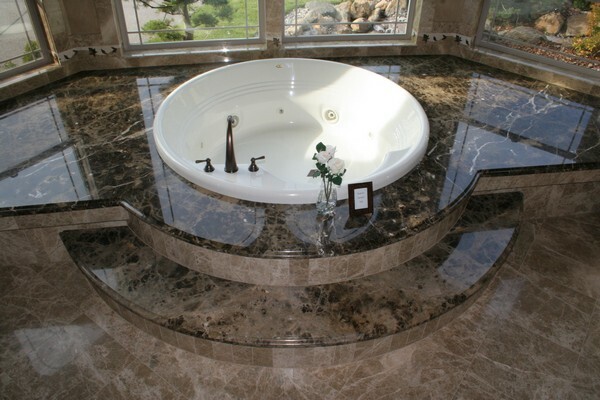 The composition of natural stone is extremely complex on a chemical and physical basis. There are immense variations in the properties of density, absorption and resilience. These factors have a tremendous impact on the necessity for specialized maintenance to protect and preserve the value and elegance of stone. In the last 20 years, there has been a revolution in the stone industry worldwide. Natural and composite stone products are the media of choice when building a new home or re-modeling and old one. Kitchen and bathroom floors, walls and counters are completed with stone applications, as well as other areas of the home. 1. Igneous Rocks (Granite) are mainly formed through molten magma. As magma is cools and condenses, it crystallizes forming the variety of colors and patterns. 2. Metamorphic Rock (Marble) which is formed of calcium carbonate minerals. Over time, pressure and movement, it crystallizes forming the range of color, variety and texture. 3. Sedimentary Rocks (Limestone): This type of stone is a collection of bottom rocks, fossils, sand and silt. They were banded through time from the heavy pressure of the stone above. Like marble, granite is also a natural stone with many colors. However, the similarities stop here. Unlike marble, granite is composed of different materials with different properties. Granite is chiefly composed of 30% Quartz and 60% Feldspar. These minerals are much harder than the calcite of marbles and for this reason granite will not scratch as easily as marble. Granite is very resistant to most acids and will not etch nor leave a dull spot on the surface, as marble does. Hydrofluoric acids, however, found in products such as rust removers, will mar the surface of Granite. Granite contains crystals, which are very distinct, appearing like small to medium stones compacted together. There are some exceptions, such as Blue Azul will have a vein like pattern, but if you look closely, the vein will also have small distinct crystals. Limestones are made of calcite from shells, coral and other debris. They are known as sedimentary rocks, because they are formed by the breakdown of other rocks, shells, etc. Limestones are usually loosely held together and may differ in porosity from marble. The course grain of some limestones give it excellent durability. Limestone can have numerous fossil impressions that are well preserved. If a piece of stone has various shell or animal like impressions in it, there is a good chance it is limestone. To identify limestone, look for fossil like impressions and loose grain structure. Limestone comes in various colors but most are shades of brown or tan, some leaning towards gray and red. All shades seem to fall into the earth tone color range. Limestone is becoming increasingly popular in the West and Southwest. Travertine is a type of limestone but differs in that it formed in a hot springs called karst. The water movement in this karst erodes the travertine creating holes in the stone. Polished travertine will usually have these holes filled with colored cement. These fillers typically are not polished and will give the travertine a blotchy appearance. Unfilled travertine will exhibit these holes and are commonly found on walls, floors, and building exteriors. Travertine is commonly found in tans and beige colors but can also be found in silver and reds. Slate is commonly gray in color, although you may find green, yellow, and red hues. It is a material from metamorphosed state. That is, it consists of clay like materials that have undergone change under heat and pressure. Slate can be recognized by its sheet-like structure. The material is usually thin, and if broken, will flake off into sheets. Slate rarely is highly reflective, unless a coating is placed on top of it. Its surface is usually uneven, unless machine sanded. Slate is also prone to detonation around water areas. Is a trade term that encompasses all green marbles? The names stems from the “serpent like bands” of greenish color occurring in massive varieties. Color ranges from a blackish green to a leek green; highly variegated to mottled in appearance. Some exhibit yellowish and brownish colorations. Serpentine has been classified as a “Marble” due to its capacity to take on a polished finish in varying degrees. Some green marbles are more moisture sensitive than others. All of these stones are relatively consistent in age, mineral composition and geological structure. They can range in colors from tans, rose beige yellows and reds. Similar textures as a slate however containing siliceous which gives the stone a slightly sharper feel. These stone are ideal for exterior applications especially around swimming pools, patios and gardens. They can be cut square for geometrical applications or commonly used in broken random pattern. Sealing is recommended every year or two. Is distinguished by its natural high quality sparkling appearances, and its shifting aesthetics as the light reflects from the variety of its mineral patterned surfaces. A variety of colors are available; very light white to silver, medium to dark grays, light to dark gold’s, soft greens to olive green, and a variety of blues. Quartz will weather well, but is highly absorbent. If used where oils from food will be present, it should be professionally treated with oil and water repellent. Terracotta, from the Italian “terra” (earth) and “cotta” (cooked) means just that…cooked earth! Terracotta refers to any bisque, pot, paver, etc. that is made out of natural clay and is fired in a kiln. Today, the most commonly used clay pavers in the United States come from Mexico. Other clay pavers that are sometimes used are antique pavers otherwise known as reclaimed pavers. Most of these reclaimed terracotta pavers come from Italy and France although they can sometimes be acquired from the UK and Latin America. Those choosing to use reclaimed pavers typically seek the old world charm that accompanies them. They are usually worn and have a more rustic feel to them. Tags: are marble pavers prone to cracking ?, facts of natural stone, moisture sensitive natural stone, Natural Stone, natural stone blogs, natural stone composition, natural stone facts, stone facts This entry was posted on Saturday, April 11th, 2009 and is filed under Natural Stone . You can follow any responses to this entry through the RSS 2.0 feed. Both comments and pings are currently closed.